HD Talk The place to discuss Blu-ray, 4K and all other forms and formats of HD and HDTV. Last edited by TheBang; 11-24-18 at 06:09 AM. 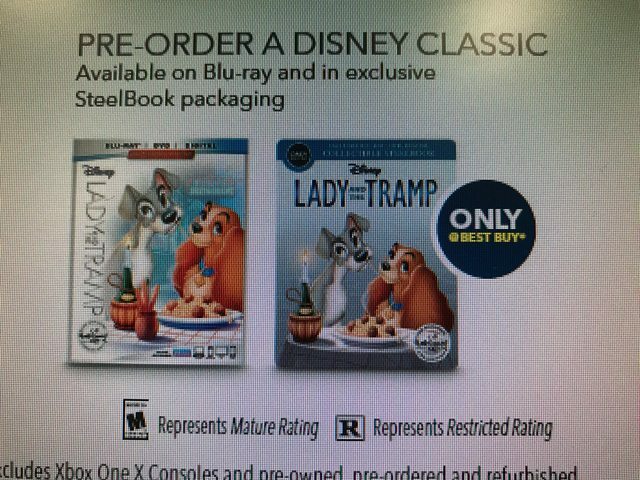 Lady and the Tramp is the next Signature Collection title. No other details available yet. Might want to change the year in the first post. Aladdin (and hopefully a non-exclusive release of the sequels) will probably come out in time to promote along with the live action movie. Do we know how many classic shorts were never released on DVD? I bought most of the Treasures 2-disc sets so I've got those, but are there more un-released? And what's the hold up with the Black Cauldron? It's so frustrating that Disney technically only has three more releases to go. They could release double features for Saludos Amigos and The Three Caballeros as well as Make Mine Music and Melody Time, and then that would leave The Black Cauldron as a standalone. A few years ago I was certain we'd eventually get these titles on Blu but now I'm not so sure. The Signature Collection films offer very little incentive for purchase, save for the inclusion of Digital Copies. As far as the upcoming SC releases, after Lady I'll only need Fantasia and Peter Pan, and even then those will be purchased just for the digital films since I already have their previous Blu releases. Blu-Ray discs hold so much, there's no reason why Disney can't include all previously released bonus features on here. I know streaming is "the future" but it's hard to see Disney snub their loyal home media consumers, especially when so many people are still buying DVDs. I'm actually not surprised that the remaining musical 4 (as I call them) have not made it to BD. I'm sure how many people would buy them. They're even that popular even within Disney movie fans. Their best bet would be to actually release them as one 4 movie combo when they do eventually release Fantasia again. That said, I would upgrade my copy of The Black Cauldron in heartbeat. Especially if they gave it some decent extras this time around. Didn't Aladdin just come out in 2015? Yes, and it just went back in the vault 4 months ago. The live action movie doesn't come out until May 2019, so that might be enough time in the vault by then (or a few months later for the home video release). They could always release them as Disney Movie Club exclusives like they've done with a lot of the DTV sequels. For The Black Cauldron - I know it's a long shot - but I'd love to see the cut footage that originally earned the film a PG-13 rating. That is not really a long time since Pinocchio came out in 2009 on Blu-ray and the re-release was in 2017. They don't seem to be interested in re-releasing them in the same order anymore, so I can see them re-releasing the Signature version of Aladdin to coincide with the BD release of the live action movie on BD. I feel like now that these films have been released so many times on disc, in addition to the inclusion of digital copies of the films, Disney has put way less of an emphasis on "The Vault" in more recent years. I imagine "The Vault" will be a thing of the past once they launch their own streaming service. The windows are necessarily going to be shorter now that they've increased the number of releases to 3 per year. I wonder when Sleeping Beauty will come out. Lady and the Tramp Signature Collection press release. "Multi-screen Edition" is their new marketing term for "Blu-ray combo pack", meaning BD plus DVD plus Digital HD. Some of the classic bonus features will be digital only. Original Theatrical Edition -- Enjoy this cherished Disney classic that captivates audiences of all ages. Sing-Along Mode -- Sing along with all your favorite songs as you watch the movie. Inside Walt’s Story Meetings -- As you view the film, hear reenactments of Walt’s story sessions with animators and see how their ideas were realized on-screen. Walt & His Dogs -- Through archival recordings and photos, hear the tales of the dogs Walt Disney owned and loved over his lifetime. Stories from Walt’s Office -- Take a tour of Walt’s office suite on the Studio lot, carefully re-created to look just as it did when he occupied it. How to Make a Meatball and Other Fun Facts About “Lady and The Tramp” -- Watch a delicious lesson on how to make perfect meatballs with teen chef Amber Kelley and Oh My Disney Show Host Alexys Gabrielle. I'd hope so, but I'm also wondering if they'll do some sort of "virtual vault" type thing by keeping certain films up for a limited time. Also, I'm just noticing now that Fantasia is scheduled to be a Signature film while Sleeping Beauty isn't. I'm fine with that since it's had so many home video releases over the past decade or so, but I do wonder what that means for its future home video releases. Maybe Sleeping Beauty is planned in the future? I have that and the Jungle Book but I had them stacked in my closet and the stack fell down and the cases got crushed so I need to replace them lol. Saludos Amigos and The three Caballeros coming to Blu-ray. Exclusive to the Disney movie club. I gave up and bought the Saludos Amigos/ Three Caballeros 2 movie DVD. Oops. But at least as was really cheap. I think it was a DMR redemption. My best guess for a release date for this is Jan. 30. But will they be uncensored? Regarding Lady and the Tramp, I've read many times that a second, non-anamorphic 1.33 aspect ratio version was shot and made available to theaters that hadn't gone widescreen yet. I've always hoped this alt version would make it to video. Last edited by Mabuse; 01-11-18 at 02:14 PM. There's no chance of that.